At approximately 11:30 p.m. on June 12, 2010, Archie Russ of Brantley, Ala., caught a 1 pound 4 ounce redbreast sunfish from the Choctawhatchee River in Geneva County. The fish was weighed on certified scales and was verified by fisheries biologist, Rob Andress at the Alabama Division of Wildlife and Freshwater Fisheries District IV Fisheries Headquarters in Enterprise, Ala. The fish measured 10.5 inches in length with a girth of 11.5 inches. 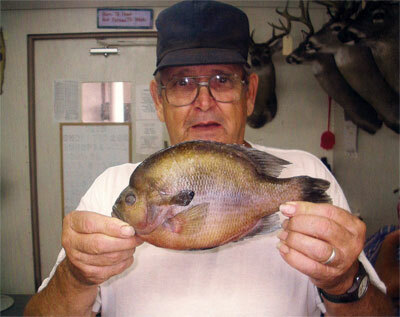 Russ' fish replaced a long-standing record of 13 ounces, which was caught from the Pea River in June 1996. This fish was accepted as part of the "Alabama Angler Recognition Program," which recognizes anglers who catch large sportfish from Alabama waters. To learn more about the Alabama Angler Recognition Program and to view current lake records, visit: www.outdooralabama.com/fishing/freshwater/record/.